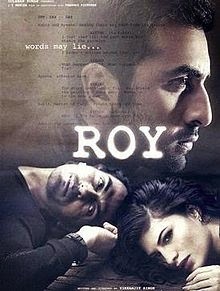 Roy is a bollywood movie directed by Vikramjit Singh. The movie is a triangular love story featuring Ranbir Kapoor, Jacqueline Fernandez and Arjun Rampal. The movie is combindely produced by Bhushan Kumar, Krishan KUmar, Divya Khosla KUmar and Freeway pictures. The scheduled release of the movie is on 13th February 2015.